On March 22, 2015, a person was on a soccer field in Cuidad Colón (in Costa Rica) when he has seen a dark manta-ray-shaped in the sky. What is it? I was on a soccer field. Saw dark hovering object against sky to tehe East. At first I thought it was a photography drone. I grabbed my camera and started capturing the object, then, I was not pretty sure what it was, because I could not see propellers, like the ones on a drone. The object had a manta-ray shape. Surface did not reflected sunlight much, despite it was a bright morning. Object overerd downtown, similar to a drone type-flight. 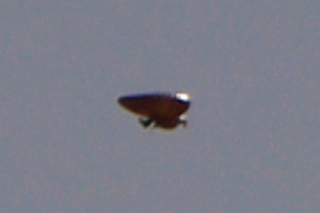 It Descended a few meters and flew slowly towards North. Object ended Up near a hill where I lost sight, blended with tree canopy. Sighting lasted around 11 minutes.